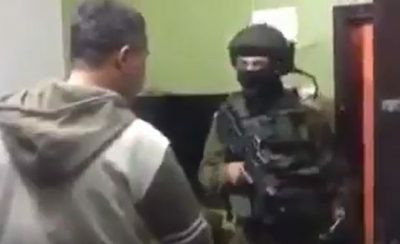 Several Israeli military jeeps invaded, on Thursday at dawn, the village of Bil’in in the central West Bank city of Ramallah, before the soldiers broke into the homes of two main figures of the nonviolent movement against the Annexation Wall and colonies, searched the properties and confiscated a computer. Approximately 40 soldiers invaded the homes of Abdullah Abu Rama, and his brother Rateb Abu Rahma, and violently searched them. The Popular Committee in Bil’in said a large military force surrounded the village, before invading it, and initiated violent and extensive searches of Abu Rahma homes. The soldiers forced each family into a room in their homes, and ransacked their properties, before collecting all mobile phones and computers, and searched their contents. The Committee stated that the soldiers confiscated a computer, owned by Abdullah Abu Rahma, and withdrew from the village. It is worth mentioning that Abdullah Abu Rahma, was released from an Israeli detention center, two days ago, following a military court ruling. Abu Rahma was held for two days when the soldiers abducted him, Monday, while attending a court hearing for activists who were abducted last Friday (January 20, 2017), during a nonviolent activity, conducted by Palestinian, Israeli and international peace activists, when they reestablished Bab al-Sham peace village (Gateway to the Sun), near Ma’ale Adumim Israeli colony.